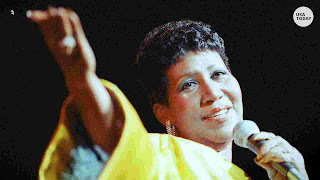 The Queen of Soul is dead. Except--scratch that. Yes, she absolutely was the dominant female soul, R&aB, and gospel singer of her (and our) time--but she was more than that. I'm hardly capable of exercising any musical authority here, but for whatever my poor opinion is worth, she was one of the dozen or so simply untouchable giants of female vocal performance in the entire history of recorded music, period. Karen Carpenter, Tina Turner, Ella Fitzgerald, Dolly Parton, Sarah Vaughn, Annie Lennox, Mahalia Jackson, Eva Cassidy, Dusty Springfield, Gladys Knight, Etta James, Barbara Streisand--I think she stood with or surpassed them all. Five performances, out of hundreds that could have been chosen. Pay tribute, y'all. "Freeway of Love," 1985. Yes, she did pop music too. Better than you. Staggering talent. Thanks for posting this. Carole King can't even. I mean, she can't even. You guys! She. Cannot. Even. Go to the dictionary for the phrase for "I can't even," and you get her reactions to this song. It's the Platonic ideal of can't evening.